Speedball Pen Cleaner is a highly effective cleaning agent for pen nibs, working quickly to remove acrylic inks and India inks from dip pens, fountain pens, and technical pens. To use, soak pen parts for 30 minutes, then flush them with warm water. 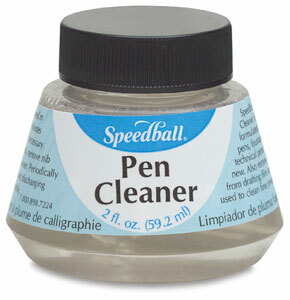 Speedball Pen Cleaner can also be used to clean brushes, drafting film, and fine jewelry.